Pizza can be a healthy meal when you make it at home. This green pizza is loaded with veggies, light on high-fat cheeses, and has a whole-wheat crust for added fiber. Two slices together are 350 calories, and contain 13 grams of protein and 8 grams of fiber, about one-third of the recommended daily intake. We love the addition of radicchio, which is rich source of vitamin K. Try this guilt-free pizza tonight, and take the leftovers for lunch tomorrow! 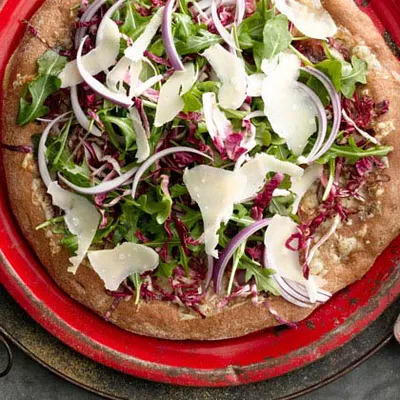 Ingredients: all-purpose flour, cornmeal, whole-wheat pizza dough, Fontina cheese, red wine vinegar, sugar, salt, garlic, olive oil, baby arugala, radicchio, red onion, Parmesan shavings.